Israeli Foreign Ministry lashes back at Palestinian Authority's ICC membership, noting it violates the Oslo accords. Israel denounced as "hypocritical" Wednesday the Palestinian Authority (PA)'s decision to join the International Criminal Court (ICC) for the purpose of seeking to prosecute officials from the Jewish state. "The Palestinian decision to join the ICC to initiate judicial proceedings against Israel is political, cynical and hypocritical," the foreign ministry said in a statement. 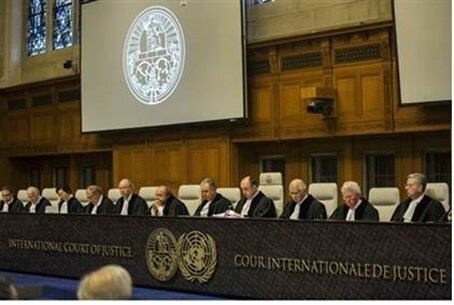 The PA applied for membership to the ICC on January 1, by signing the Rome Statute; membership only came into effect after a three-month period, on April 1. The move breached the 1993 Oslo Accords, which legitimized the terrorist Palestine Liberation Organization (PLO) into a political entity, thereby establishing the PA. The PA is to sue Israel for "illegal settlements" in Judea and Samaria, despite the fact that the Jewish presence in the region is legal under international law as was conclusively proven in the 2012 Levy Report. Likewise, it is to sue Israel for "war crimes" in last summer's counter-terror Operation Protective Edge in Gaza. That move will likely backfire, as not only the PA's "unity partner" Hamas but also PA Chairman Mahmoud Abbas's Fatah faction took part in war crimes by firing rockets at Israeli civilian centers during the war.